Welcome to Persona 4 Dancing All Night, another Persona 4 series milked game, with your favorite Persona 4 characters showing some dancing moves against shadows. That’s right peeps. They’re dancing for real. Not only fighting against shadow, now our protagonist, Narukami Yu, fight against shadow with the power of super dancing moves. HAPPY BELATED NEW YEAR Doods! May 2015 be a good year for you all! While I don’t consider myself a fan of the Atelier series (played Rorona and Totori on the PS3, failed both of the miserably) I did end up enjoying them in the end so I was excited to see these games being ported and enhanced onto the Vita. Ayesha Plus is a completely new game to me but being familiar with the series, I decided to give it a shot. Atelier Ayesha Plus is created by Gust, localized by Tecmo Koei for the PS Vita. The original (PS3) was released back in June 2012, followed by the localization in March 2013 . Fast forward 1 year, Plus comes out in Japan on March 2014. Fast forward another 10 months… and here we are! Ayesha is the 14th title in the Atelier series, but the first in a trilogy called the Dusk series. Each game in this trilogy share recurring themes and characters, and are all connected story-wise (each game takes place sometime after one another). For those who don’t know what Hyperdimension Neptunia is, it is a series of JRPGs with sort of a visual-novel aspect, that focuses on being a giant parody of video games in general. The majority of characters in these games are named after Japanese gaming companies or consoles, or gaming terms and jargon. The world is called Gamindustri and the 4 nations that reside in this world all refers to the 3 main consoles: Lastation (Playstation), Lowee (Wii), and Leanbox (Xbox). The odd nation out, Planeptune, sort of refers to Sega though as 2 characters: Neptune and Nepgear, are both named after Sega consoles. There are plenty of references and parodies of video games in this series such as Mario, Metal Gear and Pacman. As it is a JRPG it also has factors that you would expect in many other JRPGs such as fanservice, recycled assets (repeatable dungeon layout, repeatable enemies with different colours / palette swaps), and a “supposedly” deep and intricate storyline. Hyperdimension Neptunia Re;Birth 1 is the remake or “rebirth” (get it?) 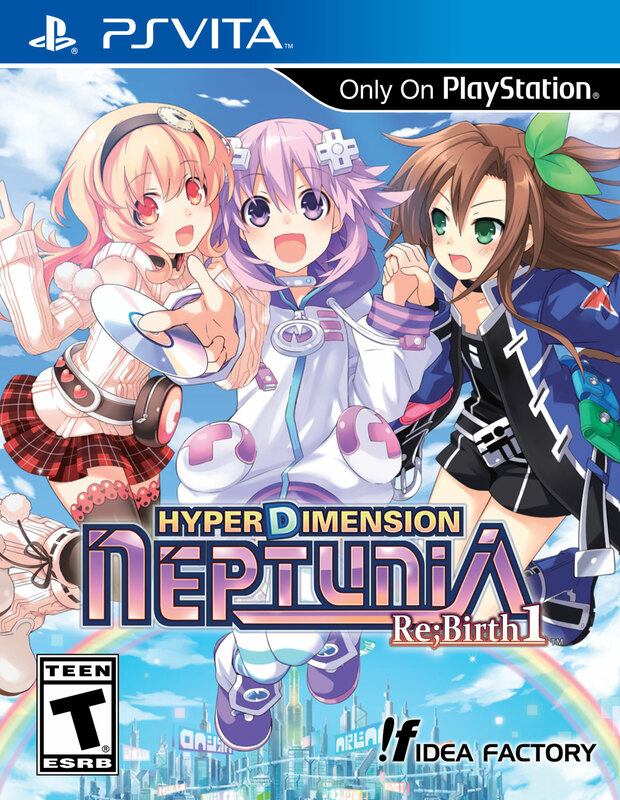 of the original Hyperdimension Neptunia that was originally released on the PS3 back in 2010. Re;Birth 1 was developed by Felistella and published by Compile Heart. Idea Factory was the distributor for Japan and Idea Factory International was responsible for the localization. The original game was not well-received by both gamers and professionals due to its unpolished gameplay, graphics and frame-rate issues, lots of recycled assets (eg: repeating dungeons), music, and use of fanservice. Despite all these cons, it managed to sell and gain enough popularity to warrant a 2nd (mk2) and 3rd (Victory) game of the series (and eventually a 4th coming onto the PS4), a few spinoffs, several manga and light novels, and an anime adapation. Rebirth 1 fixes ALOT of problems the original had by providing updated graphics, fixing frame rate issues (it’s still there but not as noticeable), story-telling (more character events, new scenes) and gameplay, by using and recycling assets from the previous released games (mk2 and Victory). As such, for those who have played these games before will realize that fact. However the game also has some new stuff including new music, more in-game cutscenes and slightly new game features.